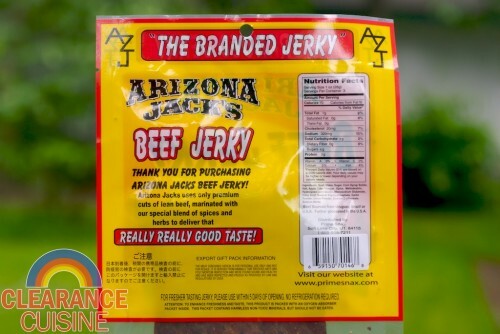 While the picture may not look that impressive, I assure you, despite the 3.25 oz weight, this is an approximately 2 foot long, 6″ wide piece of beef jerky (132 sq in) that has also been branded (literally) with the initials AZJ (for “Arizona Jack’s”). Before this moment, I never thought I’d get the chance to eat a product with the phrase “super giga” in the name, so history was made today. Beef Sourced from Uruguay, Brazil or USA – how can we lose? A quick peek at the back uncovered that the entire thing only had 210 calories for the entire strip (belt?) 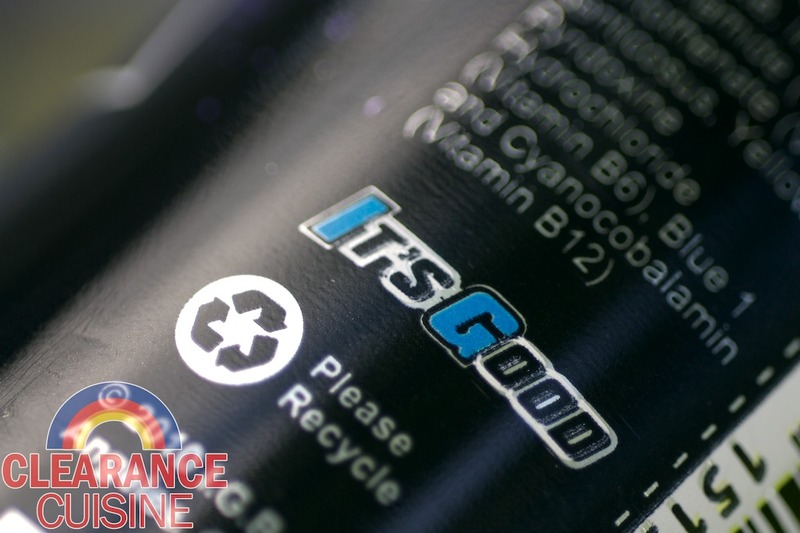 and the text boasts of a “REALLY REALLY GOOD TASTE!” (apparently the packaging of lots of the things we eat have to assure us that they are, in fact, actually good). While we did have the option of just rolling it up and stuffing the entire thing in our mouths, but we decided to have fun with it. All crazy costuming aside, this beef jerky was actually palatable (though the embedded crosshatching texture from pressing the meat made for an interesting eating experience) and was better than I expected for a brand that I had never heard of. But if anything, we had a more enjoyable time using it as a prop. 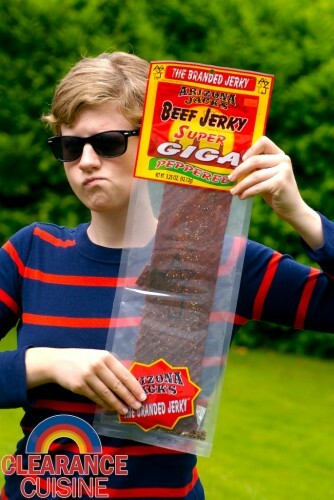 Personally, I usually make my own beef jerky because I’m: 1. cheap and 2. I usually don’t add any sweeteners and anything more complicated that salt, pepper and maybe some garlic. Since this jerky has some wonderful little touches like sugar, corn syrup solids, “spice”, apple cider vinegar and our good friend monosodium glutamate, it was a bit different than what I’m used to. However, if I did have a hankerin’ for another meat belt for casually eating, I’d probably pick another one up again for $1.99. This entry was posted on Friday, July 1st, 2011 at 1:45 pm	and is filed under Food. You can follow any comments to this entry through the RSS 2.0 feed. Both comments and pings are currently closed.